The trade deadline is always a game of hit and miss for the top teams in the NHL. Last season, however, the Stars swung and missed big time in their wishes for Cup conquest. Late last season, the Dallas Stars surveyed their options for improving their lineup in order to bulk up for a potential Stanley Cup run at the National Hockey League’s trade deadline, the final weekend in which teams can make deals such as this. 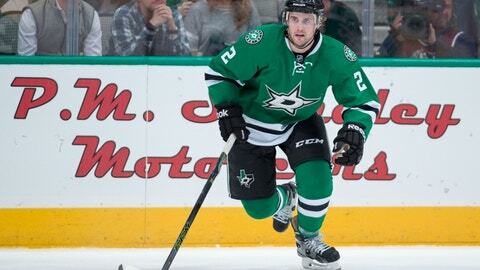 That boiled down to the Stars actively acquiring shot-blocking expert Kris Russell from the Calgary Flames for defenseman Jyrki Jokipakka, forward prospect Brett Pollock, and a 2nd-round NHL Draft selection (Dillon Dube). It was a really, really bad move. Dallas flamed out in the Western Conference Semifinals to St. Louis – the team they edged for the 2016 Central Division crown – largely in part to the shaky play of the final defensive pair. For example, in the seven game series that concluded in depressing fashion in Dallas, Kris Russell and partner Jason Demers each finished with -27 Corsi, while the top defensive pair of Alex Goligoski and John Klingberg (a duo that absolutely dominated this series from the blueline), ended with +40 Corsi. So, did the Stars make the wrong move in not wanting to sell a lot of prospects and quality draft picks in order to acquire an instant impact for the rest of the 2015-16 campaign? Yes. But, Russell’s playing style left the Stars as sitting ducks in the playoffs, as this was the only transaction the Stars made at the deadline. The Dallas Stars passed up on now-Star Dan Hamhuis in Vancouver, Panthers depth defender Jakub Kindl, Bruins rearguard John-Michael Liles, Eric Gelinas of Colorado, and the steal of the 2016 deadline, Edmonton blueliner Justin Schultz, who found a home in Pittsburgh. Jim Nill wanted dearly to improve his flawed defense all along, and doing such for cheap was his plan, so he got Kris Russell. What is forgotten by Nill is that Jamie Benn, Tyler Seguin, and Jason Spezza were all having career years offensive (especially for the highest-scoring offense in the League), and Goligoski-Klingberg was a statistically wonderful defensive duo. So, why didn’t you sell more to get more talent? Nill is confident in Dallas’s core of prospects like Devin Shore, Jason Dickinson, and Julius Honka, and therefore was unwilling to move these athletes for a drastically better shot at the Stanley Cup. Which, admittedly, makes a heavy amount of sense, but simultaneously isn’t the best way to go about it. You’re not always going to have a healthy Benn, who finished second in the NHL with 86 points. You’re not always going to have Seguin, who had his third-straight season with 30 goals or more. You’re not always going to a productive Spezza, who had a marvelous year with the Stars last season (33 goals, 30 assists). You’re not always going to have Val Nichushkin, Ales Hemsky, Colton Sceviour, Vernon Fiddler, or a healthy Mattias Janmark; you need to buy heavily to give yourself a shot at Lord Stanley’s Cup. The Stars did the exact opposite, and they’re paying the price of regret and indecision this year, where they have the third-lowest point total in the NHL. Whether or not the “window” is just opening, the Dallas Stars could have and should have done more for themselves. There were plenty of impactful players on the market, but Dallas chose just Kris Russell and nobody else. That’s all she wrote.